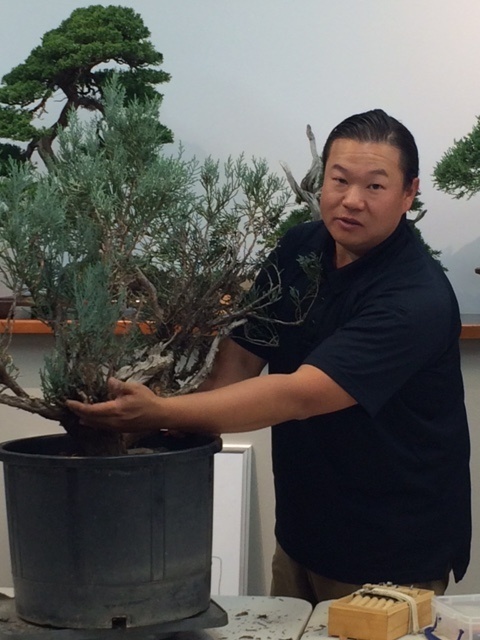 On October 4th, we had our latest presentation from Peter Tea, wherein he talked more about developing juniper trees. He started with the same tree he showed us last time, pointing out how much it had changed and what still needed to be done, and finished with a relatively recently collected tree, discussing its particular needs and limitations. On the tree from last time, Peter indicated an area that will be left alone for awhile, to allow it to grow in order to balance the design of the tree. Other areas will be trimmed as usual, to keep them in check. From there he talked more about the general methods for slowing all refined trees’ growth to maintain their designs. He reviewed a concept from last time that describes how more refined trees are, in a way, closer to death than trees in development, because their growth rate has been slowed so much, and their strong versus weak areas are so balanced, that radical changes tend to have a far more dramatic, even life-threatening effect upon them. While killing an entire tree through careless pruning is highly unlikely, if a refined tree’s balance is not maintained, over-pruning the wrong area could cause the tree to give up on that area, resulting in a localized die-off of one or more branches, which could ultimately destroy the tree’s overall design and aesthetic appeal. Talking more about the particulars of styling, Peter reviewed the tendency for accepted bonsai aesthetics to travel a continuum from more natural-looking trees to more abstract trees. When one end of the continuum is in fashion, trees from the other end start to stand out as unique, but eventually that end becomes more popular, rendering it more common and thus less unique, and the previously popular style begins to stand out again, and the back-and-forth cycle continues. Peter’s ultimate point was that as we style a tree, we should not feel overly constrained by whatever is popular at the time, because both ends of the continuum are valid and a particular style should not be dismissed based solely on what other artists are doing. Furthermore, Peter said that we should not necessarily accept a tree as it is, limiting ourselves to what the tree allows us to do easily. Real bonsai work involves doing what the chosen style demands, regardless how difficult it may be. A well-tapered trunk also contributes to an aged look, but is not as important on junipers, since they don’t tend to acquire taper in nature. 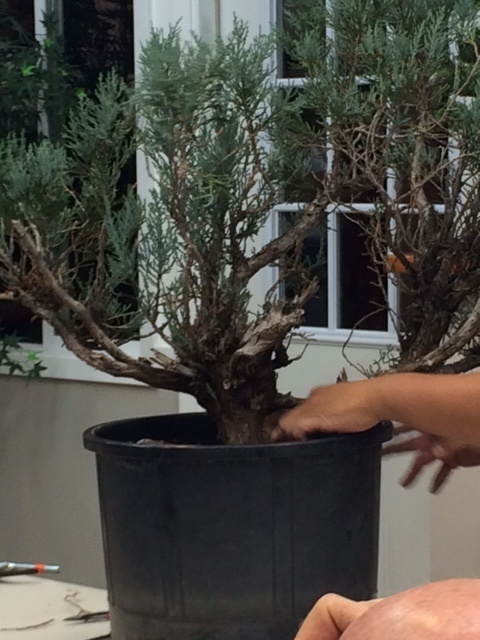 Peter spent the last hour of his presentation discussing a juniper that had been collected about two years earlier. Among the interesting points he made during this part of the presentation was the fact that collected Sierra and California junipers have better chances of survival if their soil is kept relatively dry and the foliage is generously misted. That was our last presentation of the year. As the year winds down, so do our club activities. Stay tuned for details about the club Holiday party in December and what we’ll be doing next year.